Ride and Shine | The PREMIER NJ Cleaning service — Selling your car? You might need a detail! Selling your car? You might need a detail! When it comes to the resale value of your vehicle, there are many factors that dictate how much you will be able to get back for it. Mileage, prior damage and repairs, current issues and last but not least, cleanliness will all come into play when negotiating on price. Ultimately, the image of your car plays a huge role when potential buyers examine it for purchase. So, to make sure you're not missing out on any money when selling, you may want to consider having your car detailed inside and out for maximum profit! In this blog, we are going to walk you through an example of an interior detail that was performed so it could be put on the market for resale. 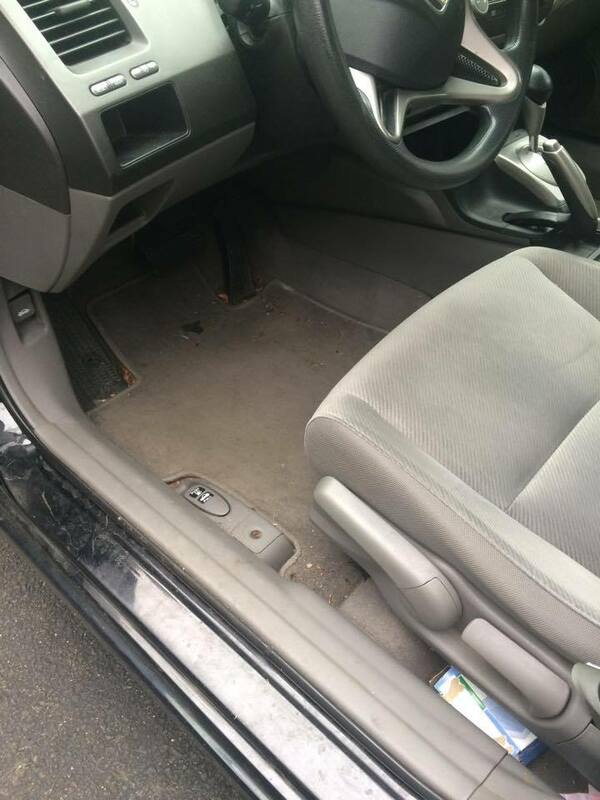 This vehicle was a black Honda Civic that had a fair amount of dirt and grime built up throughout the interior. We performed our "Daily Driver" package on this vehicle which includes a full interior detail and modest exterior detail, however, for this blog, we are just going to focus on the inside. Interior cleaning with vacuuming, wipe down of all surfaces, door jambs cleaned, garbage removal, carpet / upholstery cleaning, stain removal, steam cleaning (when necessary), window cleaning, dressing for vinyl and plastic. Exterior cleaning which includes a hand wash, clay bar, wax, tire clean, rim clean, tire dressing. 2) Wipe down of all surfaces using All Purpose Cleaner. (APC) That means we get the door jambs, door panels, all plastic and vinyl, center console and steering console etc. 3) Carpet, mat and seat cleaning using APC and scrub brushes. 4) Steam cleaning to treat stains and any dirt and grime that is stuck in tight spaces. Steam cleaning is great because it also packs a little pressure that helps to dislodge any debris that is stuck. 5) Vacuum a second time to pick up all the debris that has been dislodged. 6) Apply dressing to plastic and vinyl for a great finish. Note: For vehicles that have leather, we would clean and condition that as well. Took about 2 hours and 45 minutes to do the interior. As you can see from the pics there was quite a lot of dirt and debris to remove. Overall, the client was very happy with how it turned out. We have found it almost always helps the resale value of cars to have the interior (and exterior) thoroughly cleaned before being put on the market!